Kamadhenu - Surabhi - !! Welcome to Sudarshana Sena !! Kamadhenu (Sanskrit: कामधेनु, [kaːməˈd̪ʱeːnʊ], Kāmadhenu), also known as Surabhi (सुरभि, Surabhī), is a divine bovine-goddess described in Hinduism as the mother of all cows. She is a miraculous "cow of plenty" who provides her owner whatever he desires and is often portrayed as the mother of other cattle as well as the eleven Rudras. In iconography, she is generally depicted as a white cow with a female head and breasts or as a white cow containing various deities within her body. All cows are venerated in Hinduism as the earthly embodiment of the Kamadhenu. As such, Kamadhenu is not worshipped independently as a goddess, and temples are not dedicated to her honor alone; rather, she is honored by the veneration of cows in general throughout the observant Hindu population. The Mahabharata (Adi Parva book) records that Kamadhenu-Surabhi rose from the churning of the cosmic ocean (Samudra manthan) by the gods and demons to acquire Amrita (ambrosia, elixir of life). As such, she is regarded the offspring of the gods and demons, created when they churned the cosmic milk ocean and then given to the Saptarishi, the seven great seers. She was ordered by the creator-god Brahma to give milk, and supply it and ghee ("clarified butter") for ritual fire-sacrifices. 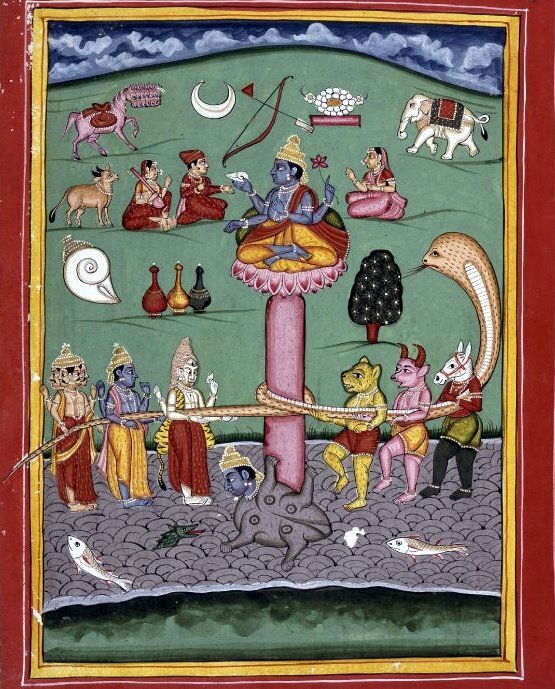 The Anushasana Parva book of the epic narrates that Surabhi was born from the belch of "the creator" (Prajapati) Daksha after he drank the Amrita that rose from the Samudra manthan. Further, Surabhi gave birth to many golden cows called Kapila cows, who were called the mothers of the world. The Satapatha Brahmana also tells a similar tale: Prajapati created Surabhi from his breath. The Udyoga Parva Book of the Mahabharata narrates that the creator-god Brahma drank so much Amrita that he vomited some of it, from which emerged Surabhi. The Matsya Purana notes two conflicting descriptions of Surabhi. In one chapter, it describes Surabhi as the consort of Brahma and their union produced the cow Yogishvari, the eleven Rudras, "lower animals", goats, swans and "high class drugs". She is then described as the mother of cows and quadrupeds. In another instance, she is described as a daughter of Daksha, wife of Kashyapa and the mother of cows. The Harivamsa, an appendix of the Mahabharata, calls Surabhi the mother of Amrita (ambrosia), Brahmins, cows and Rudras.